Companies across Alabama are investing millions of dollars in new and expanded specialty food processing operations that tap into growing national trends. From pickled okra and salsa in Pike County to dehydrated fruits and vegetables in Foley, the projects were part of a record year of economic development for the state in 2015, with overall announcements that totaled $7 billion and 20,000 jobs. They seek to capitalize on the popular push among consumers to eat more locally sourced foods. At the same time, they’re providing employment and investment in Alabama’s rural areas, as well as new avenues for the state’s farmers to bring their own products to market. In Baldwin County, Bon Secour Valley Ingredients is a new company that will dehydrate fruits and vegetables and also mill them into flours and powders. Products will include sweet potatoes, chicory, carrots and kale, sourced from farms in Alabama or elsewhere in the Southeast. The $8 million, 65-job operation in Foley is scheduled to start up this summer. BSVI is a new division of the Woerner Companies, a family agriculture business that primarily sells turf products. “We’re trying to move into sustainable agriculture and to do that, dehydration and food ingredients are where it’s at,” said Christina Woerner McInnis. BSVI will use local produce that’s not pretty enough to make the cut for supermarket shelves but still has the same taste and quality. The result will be new markets for produce that might otherwise go to waste, McInnis said, particularly when it’s turned into powders. “We could sell it to a food company that might put it in a soup or to a company that would put it in a dog treat,” she said. 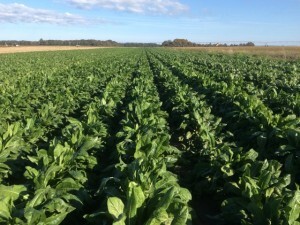 Bon Secour Valley Ingredients’ chicory after processing. Mike Murphy, general manager for BSVI, said the business aims to capture some of the massive food waste that occurs in distribution channels, estimated at 1.3 billion tons globally. “A third of the food that’s grown in the world never makes it to the fork,” he said. Another new company is iSpice, which is investing $9 million in the Clarke County town of Jackson, where it is renovating a building. While the facility will mainly be a packaging operation, it also will have grinding and blending capabilities. Large retailers and food service companies will be iSpice’s key customers. Operations are expected to begin this summer. In Pike County, Southern Classic Food Group in Brundidge is starting a new division called Magnolia Vegetable Processors, which is scheduled to begin producing pickled okra in August, followed by pickles and pickle relish. “For years, we’ve had people ask us about whether we do pickles, and we’ve always used pickles as an ingredient in our tartar sauces and Thousand Island dressing,” said Chuck Caraway, president of Southern Classic Food Group. The company is spending $5.5 million on the project and plans 60 new jobs. In the second phase, the plan is to make salsa, now the No. 1 condiment in the U.S.
An expansion also is under way in the main business, Caraway added. The company is spending $3.2 million and adding 21 jobs in a project that is installing a new production line for fruit juices. Southern Classic Food Group makes a wide range of condiments, the largest being mayonnaise, that is sold to retail, food service and industrial customers that use it in chicken, potato and pasta salads. Other established food producers in Alabama are expanding, too. 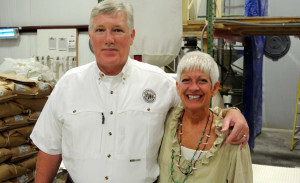 Jeff and Peggy Sutton operate the To Your Health Sprouted Wheat Co. in Bullock County. In Bullock County, To Your Health Sprouted Flour Co. has a $3 million, 20-job project. The company, launched 10 years ago by Bullock County native Peggy Sutton, is the world’s biggest producer of organic sprouted grains and flours with more than 50 products. Current production averages 50,000 pounds per week. Sprouted products have surged in popularity in recent years, thanks to their taste and nutritional benefits, and the total market is expected to soon eclipse $250 million in revenues. 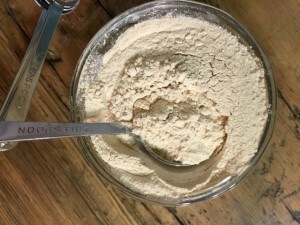 To Your Health Sprouted Flour Co. exports to several countries and counts among its customers big names such as Kashi, Nature’s Path, Amy’s Kitchen and Whole Foods Market. 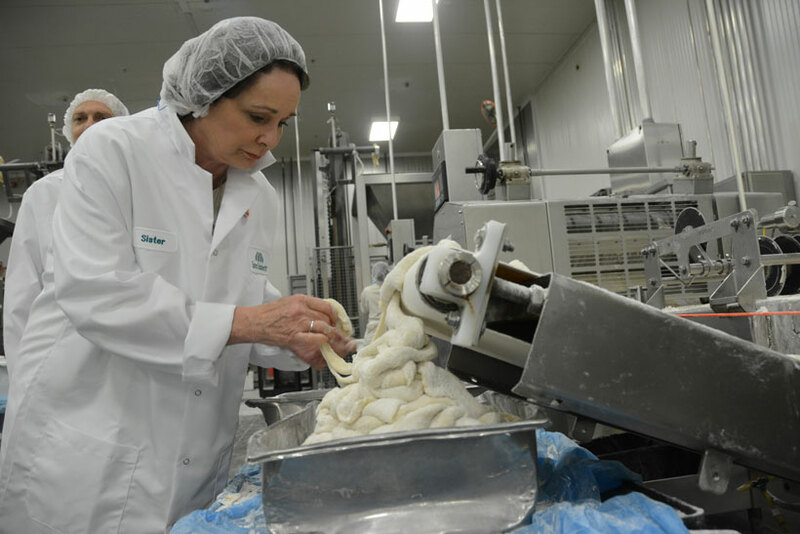 The well-known Sister Schubert’s brand, maker of dinner rolls, sausage wraps and other baked goods sold in thousands of stores across the U.S., also continues to invest in its Alabama operations. The most recent is a $2.2 million wellness center at the company’s bakery in Luverne. The facility features comfortable chairs, big-screen TVs, showers, vending machines and large windows that bring in plenty of light, said Patricia “Sister Schubert” Barnes. Barnes said there are new products on the horizon for Sister Schubert’s, but it’s too early to talk about them. She feels blessed to be in Alabama, and she considers herself an ambassador for state-made products.